Dense, yet moist carrot cake layers generously smothered with sweet and tangy cream cheese frosting. It’s everything you want your layered carrot cake to be. I have shared this recipe 2 years ago, on this blog. It was when I just started blogging, or should I say filing my recipes online? The old photos make me cringe, but the recipe is golden and needed to be shared. So couple weeks ago, I made my favorite carrot cake again, as I always do every spring. Instead of diving right into it, I snapped a few photos to bring life to the recipe and share it again with you. Dense, yet moist layers of carrot cake is literally smothered with the most delicious cream cheese frosting (<- my husband’s favorite). 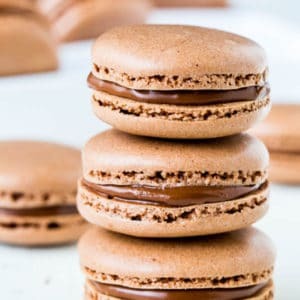 What I most love about this recipe, besides the frosting, is that every bite is loaded with chewy walnuts. Such contrast in texture! Despite heaping 3 cups of carrots, this cake doesn’t taste anything like a vegetable cake. Instead, it’s sweet, tender and moist without hint of carrot taste. Unlike some classic carrot cake versions, this cake doesn’t have pineapples. I never understood the purpose of them, other than adding more moisture. In this case, the cake is plenty moist and doesn’t require anything additional. When I was making my carrot cake this time, I wanted to experiment to see if I can improve the recipe in any way (not that it needed it). I used half granulated sugar and half brown sugar. I didn’t mention anything about it to my husband. Half way through his cake, to my surprise, he says: “I don’t know why, but this is not your usual carrot cake.” I was completely blown away, because when I was taste testing it myself before his arrival, I thought the same thing. A little drier, a little mellower. Something was off. I have no idea why that is, since brown sugar is supposed to add more moisture and kind of molasses flavor, right? Anyway, I decided to keep my recipe as is. Oh and one more thing. Have you ever heard of Evenbake bake strips to wrap around your baking pan to create perfectly flat cakes? Well, I tried it and it works great. My cakes were perfectly even and great for layering. If domed cake tops bother you, I’d recommend giving it a try. Hope you enjoyed my recipe today. Thank you for stopping by! Preheat oven to 350 degrees F (175 degrees C). Line two 9-in (23cm) round cake pans with parchment paper and coat with cooking spray. In a mixing bowl with paddle attachment, beat the eggs, vegetable oil, sugar and vanilla extract until combined, about 2 minutes. Add the flour mixture and mix until mostly combined with some dry flour visible. Add shredded carrots and pecans. With rubber spatula, mix the batter until everything is just combined. Divide the batter into the prepared pans. Bake for 23-25 minutes, or until the inserted toothpick comes out clean. Transfer to wire rack to cool for 5 minutes. Then remove the cakes from the pan and cool completely. Meanwhile, make the frosting. In mixing bowl with whisk attachment, beat the cream cheese and butter until fluffy. Add powdered sugar, heavy cream and vanilla extract. Beat the mixture on low for a minute, and then slowly increase the speed to medium high. Beat the frosting until smooth and fluffy, about 3 minutes. To assemble the cake, spread half of the frosting on one cake. Then place the second cake on top and spread the remaining frosting. Decorate with some pecan pieces, if desired. Store the cake in airtight container in the fridge for up to 5 days. In order to keep the cake tops flat, I used these evenbake cake strips with my dark cake pans. Works like a charm. Hi, Anita. I have no experience baking without eggs and can’t give you a good advice. Sorry. Years later and you still get new followers. Can I just put the whole recipe in a 9×13 greased pan? How long would you bake it? 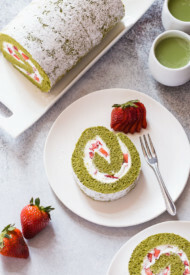 Can’t wait to make this….it looks delicious. Hi, Annabelle. I think you can bake this into 9×13 cake. I’d start checking at 25 minutes. Hope you’ll enjoy it. Let me know how it turns out if you try it. Thanks for the comment! Thank you for the recipe. 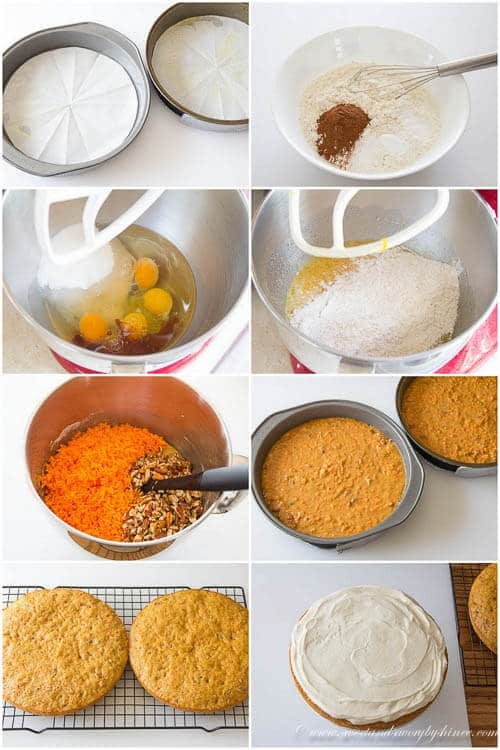 i will definitely try this carrot cake recipe and will let you know 🙂 . Yay, so glad you like the recipe. And please let me know how it turns out. 😉 Thanks! Thanks for the recipe! Can I ask why you use vegetable oil instead of butter? Delicious! 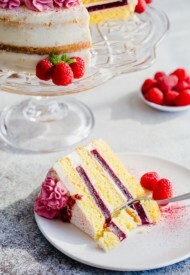 Its so moist, not overly sweet, and the cream cheese frosting is heavenly match for this cake! The cake is much yummier the next day, that is if you have any leftover…. 🙂 thank you Shinee for the perfect recipe! Yay, awesome! Thanks for your feedback, Olya! Happy to hear you loved the cake. Carrot cake is my husband’s favorite and now I think I’ve found my recipe! Pinned and saved to be cooked soon. Thanks for the gorgeous recipe. Just tried this one…..and OMG…. perfecto!! Friends came and ate it all up less than 10mins. Changed the pecans with toasted almonds…yuuumm! Thanks for the awesome recipe shinee…. Citra, I’m so happy you enjoyed the cake! Toasted almonds sounds good too! Thank you for your feedback! This looks so yummy!! I just tried to bake my first carrot cake…it didn’t look as good as yours!! lol!! Found You at Artsy Fartsy Mama – Link Party!! Hey I would love it if you stopped by my place and shared your stuff on my Link party – My 2 Favorite Things on Thursday!! Hope to see you there!! Looks delicious and beautiful! Pinning! I would love for you to share at this weeks Happiness Is Homemade Link Party! Happy Easter! I love moist carrot cakes and yours looks fantastic, Shinee! Shinee, this carrot cake is gorgeous!!! This might be my winner for Sunday!!! I’ve been looking for a carrot cake recipe! I’ll let you know if I try this !!! looks SO good!!!! Wonderful recipe and gorgeous pictures! I love carrot cake and your version looks moist and perfect. Can’t wait to try it out soon! This cake is gorgeous! I hate old photos too, but these look amazing! 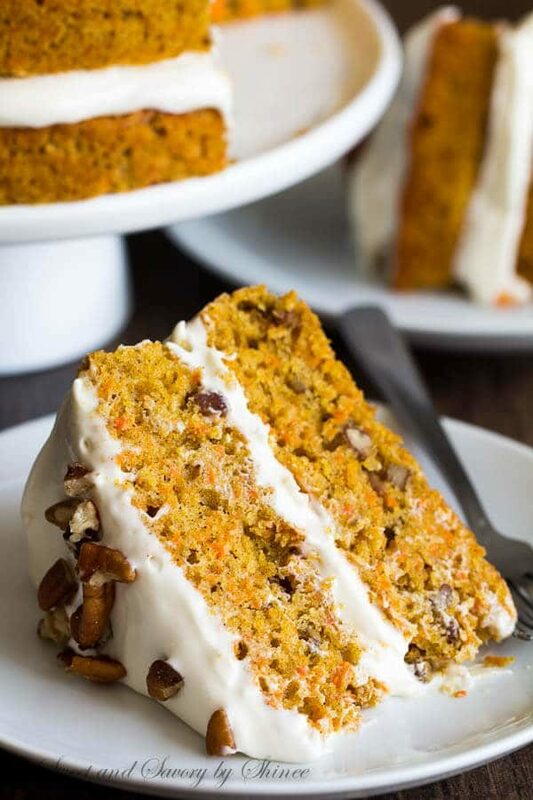 This carrot cake is perfection! 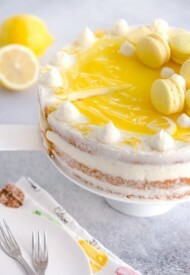 I don’t like pineapple in mine either, I love cream cheese frosting AND I love the layers! Divine and an absolutely wonderful way to finish Easter dinner! Thanks for sharing! YUM! I love carrot cake! This looks sooo delicious. Love the addition of pecans on top! Looks like the perfect cake for Easter!! It sure is, Lisa. Thanks! Absolutely delicious!! I love to layer my carrot cake too… extra frosting is always a good thing! Can’t agree more, Lucy! Thank you. I love naked cakes and your carrot cake looks delicious. so beautifully layered. love carrot cake in general but im loving it as a layered carrot cake!